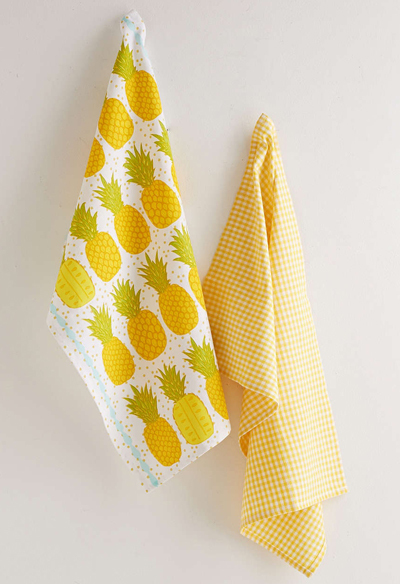 Brighten up with this Pineapple Tea Towel Set in coordinating pineapple and gingham prints. Set of two. $18. Buy here. 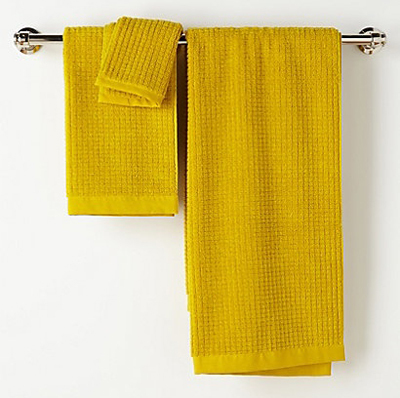 Add sunny style to your space with this soft, sculpted Yellow Sculpted Tile Riviera Bath Towel Collection. 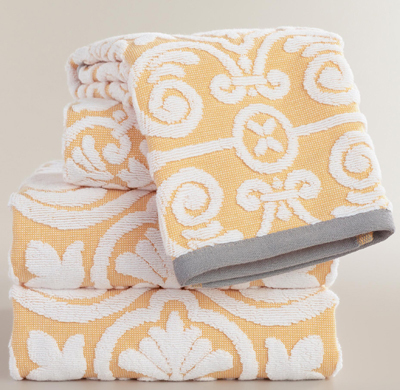 Crafted of Turkish cotton in warm white and yellow, they feature a scrollwork tile pattern and contrasting frost gray border. $9.99-$14.99. Buy here. Delicate pintuck pleats add a textural border to these soft Organic Pleated Edge Towels. After just a few washes, they get twice as soft. Make a set more personal with a monogram. $6-$24.Buy here. 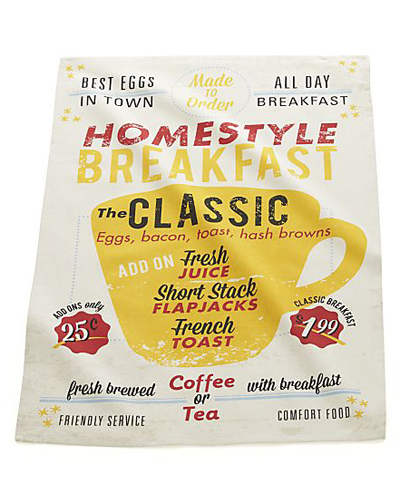 This Breakfast Diner Dish Towel features retro diner graphics that invoke the nostalgic comfort food spots of the past with a charming coffee cup motif surrounded by menu offerings on a cotton background. $5.95. Buy here. 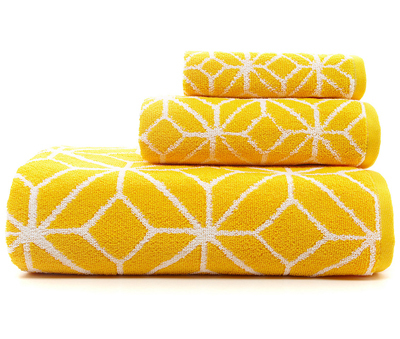 From Trina Turk, these lemon yellow ultra-soft and absorbent Trellis Bath Towels feature a unique geometric pattern. $10-$25. Buy here. 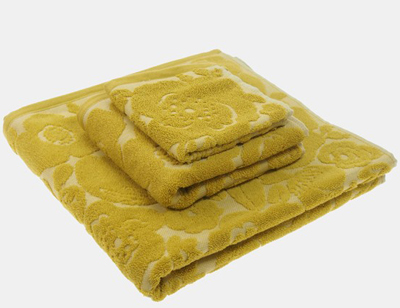 These Poppy Jacquard Bath Towels feature jacquard poppies that perk up a soft and stylish towel made from plush cotton. $7-$24. Free shipping. Buy here. 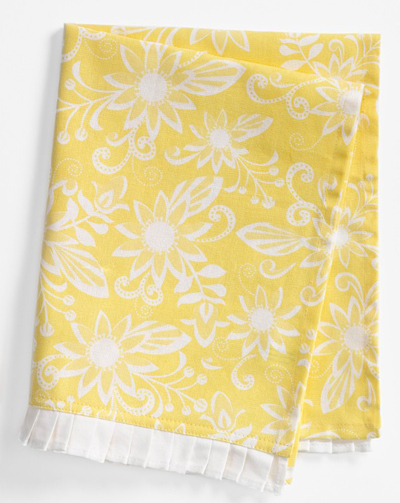 The Yellow Calypso Soleil Kitchen Towel features charming pleats that edge a sunny, floral-print kitchen towel from designer Iza Pearl. $10. Free shipping. Buy here. 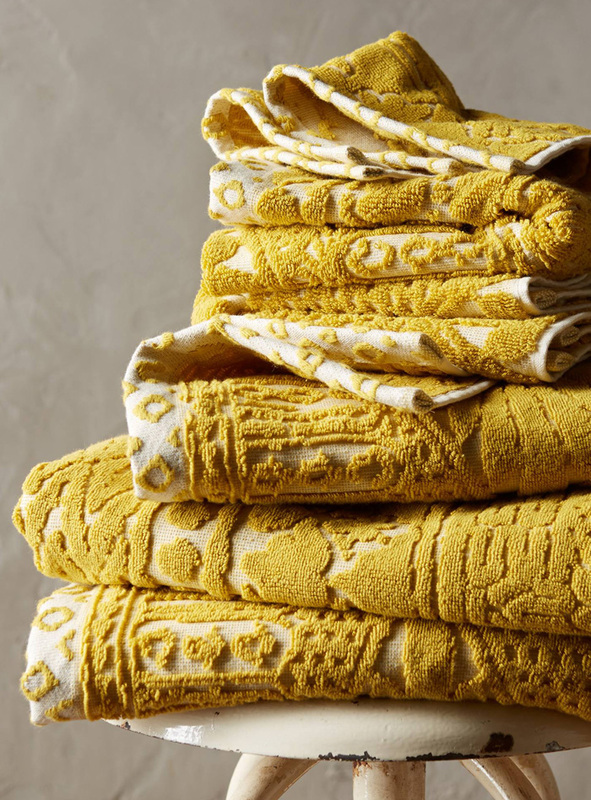 Woven in Portugal from supremely soft cotton, these Mustard Border Frame Bath Towels are lofty, absorbent, quick to dry, and won’t fade, fray or wear out. We love how the substantial stripe pops against the pure white cotton terry. 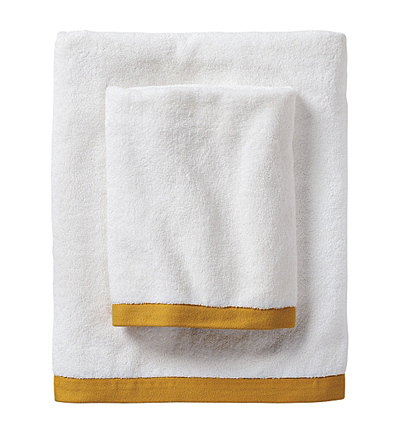 (The washcloth was kept simple – a perfect square of all white.) $8-$48 Sale $8-$38. Buy here. Liven up your bath with the playfully bright vibe of these SONOMA life + style Catalina Bath Accessories. Fabric shower curtain, rug and towels features a clover motif. $19.99-$59.99. Buy here. 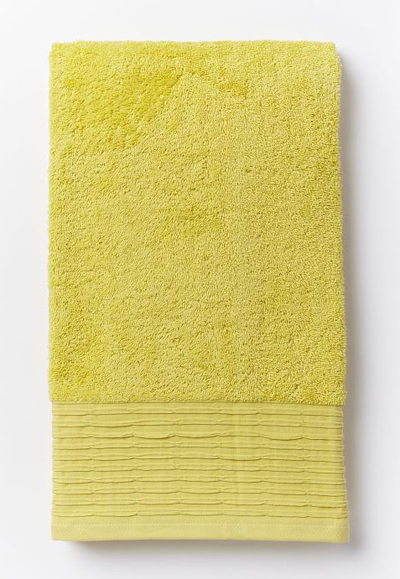 Update your bath with the plush and absorbent Waffle Towel. Made of cotton/linen. Available in washcloth, hand towel or bath towel. $16-$78. Buy here.